The extra story “Stewart and the Great Wall” is a map and instructions about how to get to Simatai. 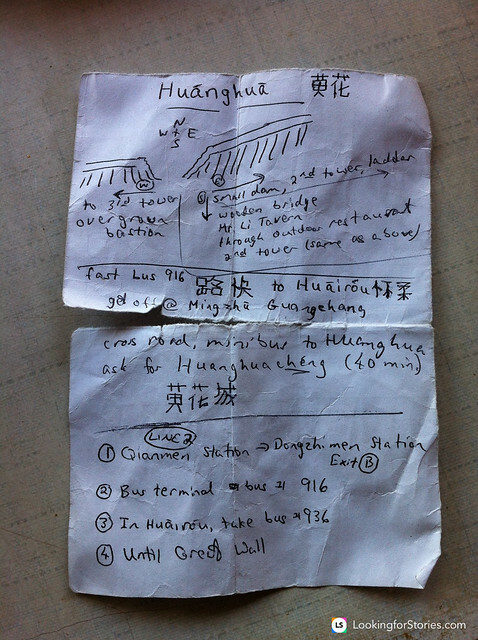 Stewart Falconer met an Israeli in a hostel in Beijing that left written instuctions about how to get to the “Great Wall of China” by public transport, for few yuan. First, we took the subway from Dongzhimen Station to the bus terminal, then we went to the Line 916 FAST that is inside the station, because outside there is a line with that number that is not correct. Then we got off at In Huairou, where many drivers tried to throw us off by telling us that the bus we wanted did not exist, because they wanted us to take their taxis to earn a few yuan and also wanted to take us to the tourist site of the wall, where there are many people. We couldn’t return by the same way, because of the late hour. We watched the sunset and were late for the bus, as we were told, the last one to come from Beijing’s Huairou In was at 19h. The owner of a grocery store accompanied us to a village near Beijing for 50 Yuan, and from there we took a bus that dropped us off in Beijing. Anyway, the sunset on the Great Wall was an unforgettable experience.